Printed maps are often provided by Visitor Centers, Event Promoters, Tourist Attractions, Information Desks, Rental Car Agencies, Hotel Reception Areas and Concierge Stations…plus many other places and venues where people might need some assistance to efficiently navigate the local area. 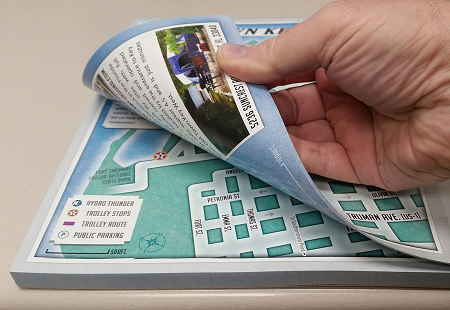 Producing maps as tear-off pads makes for a very simple and convenient way to store and distribute the maps. Tear-off map pads are created by applying a flexible adhesive along one edge of a stack of same-sized maps. The adhesive secures the printed maps as a unit, but allows the topmost map to be easily removed when needed. Most map pads incorporate a chipboard backer for rigidity. Tear-off pads can be produced in just about any handy size, but work best for maps measuring 17” x 11” or smaller. Also, tear-off maps can be printed in color or grayscale, with the printing on one or both sides. In addition, tear-off maps are very economical, making them well-suited for one-time use. What types of Maps are commonly created as Tear-Off Pads? What are the Benefits of Tear-Off Map Pads? If you’d like to learn more about the benefits of creating maps as tear-off pads, give Formax a call at 866-367-6221. Or, if you already know your specs and would like a quote, click here to access our easy quote request from. Whether you need 100 or 10,000 map pads, we’re here to help! Why Choose Formax for Your Printing Needs?